We don’t always know what to do with data when we see it. And sometimes there’s nothing we can do with it, except tuck it away for a rainy day. What if we could strive to use data to inform decisions we make about programs, policies, and day to day actions? What would that world look like, and how would we use the data? Would we use other types of information to inform our decisions? 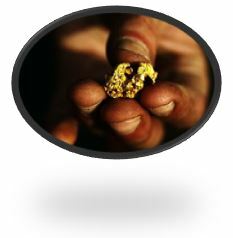 What would it take for you to have the convergence opportunity available as often as you need it? What types of decisions do you face that you wish you had data, research, and community voice about? 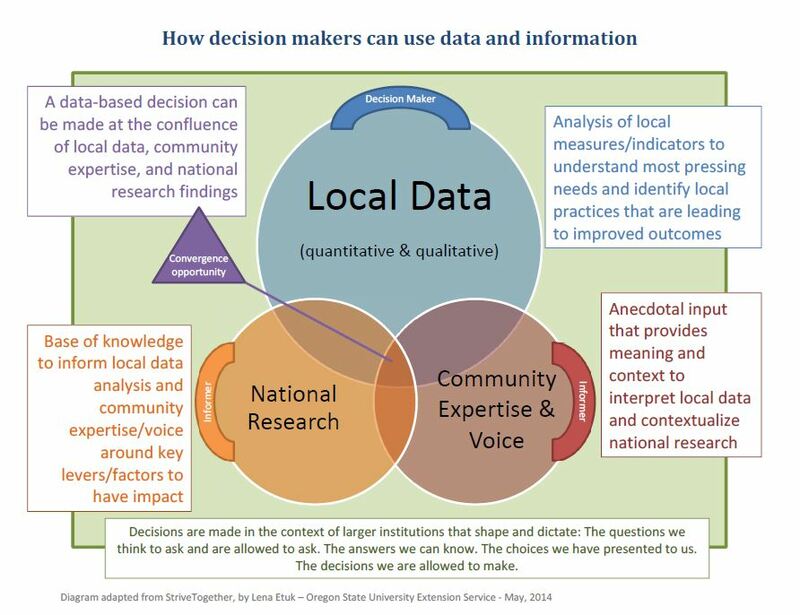 When have you used data, research, and community voice to inform a decision? Sorry folks, I’m still on the 40-40-20 kick. I’m working on a project to put outcome based planning into action and 40-40-20 is the outcome of the day. 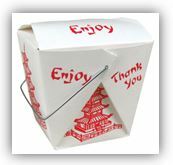 So if we want to achieve 40-40-20 (recall that’s 40% of Oregon adults with a Bachelor’s degree, 40% with an Associate’s degree or post-secondary credential, and 20% with High School), it would be good to know if there are any places in Oregon that are coming close to achieving that so we can use them as models for replication elsewhere. 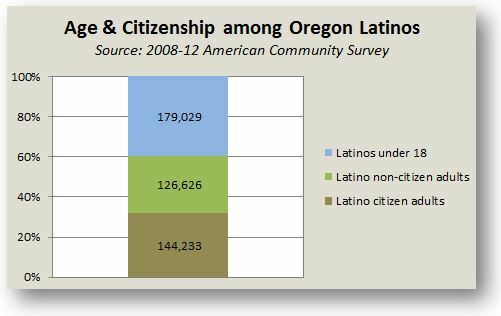 I looked at data from the American Community Survey (ACS) across all counties and towns in Oregon, for the 2007-2011 period and found only one that was at 40-40-20: Tetherow, OR at 48-52-0. A tiny (45 people), affluent, resort community outside of Bend, where all the employed adults work as management professionals in the education, health, and social service industry. Tetherow may be a town to learn from, but it may be a bit of an extreme example of the conditions for 40-40-20. Let’s relax our demands and look for counties and towns that come close to achieving parts of the 40-40-20 goal. There is one county that is at or above 40% with a Bachelor’s degree or more: Benton County – it’s at 47-7-16. Go Beavs! There are no counties that come close to 40% of adults with an Associate’s degree, but Sherman County was the highest, at 14% — it’s at 16-14-28, followed by Josephine, Deschutes, and Gilliam. 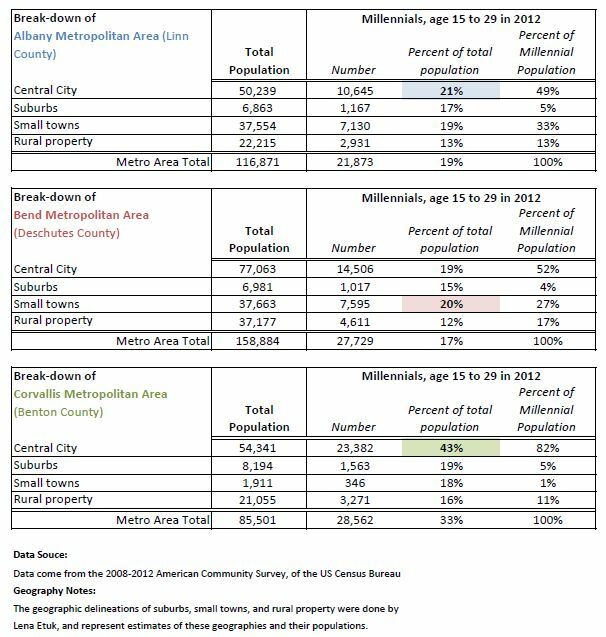 An interesting mix of non-metropolitan and newer metropolitan counties, all with higher than average employment in construction, extraction, and maintenance occupations. 42 (11%) of the 372 towns in Oregon recognized by the Census Bureau have 40% or more adults with a Bachelor’s degree or more. You can access that list here: Townsw40BS. These towns are our big cities, are very closely adjacent to our big cities, or are amenity destinations high in second-home ownership. These towns all share some characteristics as well. They’re small and either associated with high-value natural amenities and vacation rentals or adjacent to affluent communities. There are 56 towns that hover around the 20% goal for adults with high school education (have between 16% and 24% of adults with high school). You can access that list by clicking here: Townsw20. These findings suggest that there are certain types of local conditions associated with the 40-40-20 educational outcomes: natural resource amenities, affluence, adjacency to metropolitan areas, and maybe others that you’ve thought of as you read the lists. Though we can’t do much about the availability of natural resource amenities across all parts of the state there may be attributes of the economies or culture of these areas that can be replicated. How would implementing those conditions affect existing populations and their qualities of life? How might we play a role identifying or trying to create these conditions? What additional data might we need about these communities? The findings also illustrate that there may be some difficulty ahead in achieving the 40% with an Associate’s degree or post-secondary credential goal. Very few communities have attained it and we don’t have a reputable, consistent source of data about the number of Oregon adults with a short-duration post-secondary credential. This demonstrates the importance of setting goals for program planning that are measureable and attainable – a key lesson for outcome-based, data-driven planning. Posted in Education, Rural, Urban. If we want to achieve 40-40-20 we have to face some demographic realities. 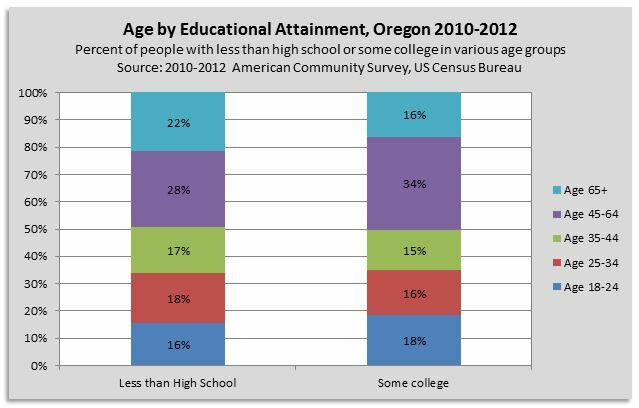 Ensure that at least 40 percent of adult Oregonians have earned a bachelor’s degree or higher. Ensure that at least 40 percent of adult Oregonians have earned an associate’s degree or post-secondary credential as their highest level of educational attainment. Ensure that the remaining 20 percent or less of all adult Oregonians have earned a high school diploma, an extended or modified high school diploma or the equivalent of a high school diploma as their highest level of educational attainment. According to the 2010-12 American Community Survey we’re at about 27-8-25 right now in Oregon. So clearly, we’ve got some work to do. In order to attain 40-40-20 there are two groups of people we really need to pay attention to: adults with less than a high school education and adults with only some college, because they fall outside the Bachelor’s-Associate’s-high school group. 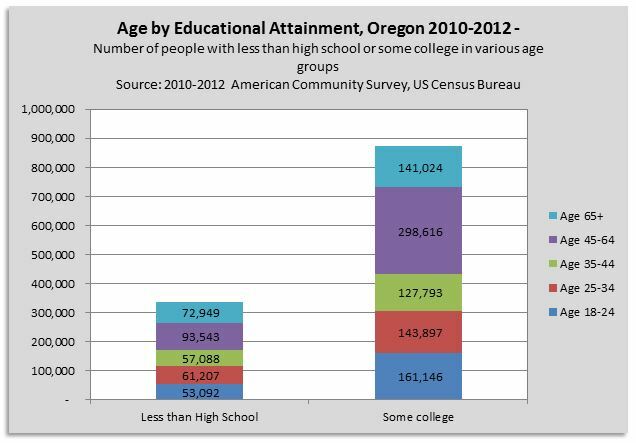 Unfortunately for 40-40-20 goal attainment, there are a lot of Oregon adults, at different stages of the lifespan, who have less than high school education and who only have some college. So we have to figure out if we should encourage all of them to increase their levels of education and how we might go about doing that. That’s a lot of people to be outside the desired education groups! So chances are the only way we’ll be able to make a dent in this as a state is for all of us involved in education to work together. And as Extension, we definitely will because we interact with adults across the lifespan – and targeting adults, particularly those 45 and over, is going to be key to this. 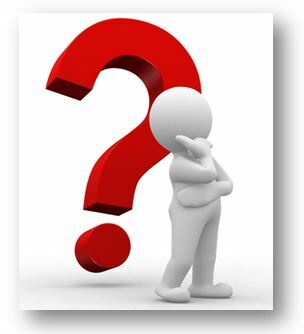 Sorry folks, but this time around I don’t have lots of neat take-aways for you – just lots of questions. This exploration into Oregon’s people, places, and society is a real head-scratcher for me. Maybe for you too? How do we encourage adults between the ages of 25 and 64, who have less than high school or only some college education, to go back to school to get a GED or a post-secondary credential? Many of these folks are busy people – they work for pay outside the home, they work for no pay inside the home taking care of their children or other loved ones, they’ve got kids, and they’ve got established lives. Is increasing their level of education a priority to them? Should we encourage them to make it a priority? How? If we decide we do want to encourage people across the working-age life span to go back to school, are there going to be different approaches needed to encourage them to do so? What will those look like? Honestly, should we be striving to increase the educational attainment of adults age 65 and over? If so, how do we realistically encourage these older adults to go back to school and increase their level of education? Maybe the only real take-away I can offer is that we’re going to have to put our heads together on this one to reach the 40-40-20 goal. It might be worth some really concentrated effort among us in Extension, precisely because we do interact with a lot of people across the adult lifespan. How can we, Extension faculty and staff, help achieve the 40-40-20 goal? What’s up with Hood River County? I was recently inspired to look across Oregon for examples of communities that have experienced positive changes in big, tough social areas. So I pulled together 2000 and 2007-2011 county-level data on poverty and unemployment to see if any counties stuck out. Lo and behold Hood River is the only county in Oregon where poverty and unemployment actually decreased between 2000 and 2007-11! So, what’s up with Hood River County and what’s their secret to success?! Depending on which stats you look at, from which agency, it looks like Hood River County’s overall economic wellbeing either improved between 2000 and 2011 or degraded slightly/severely in this period. The discrepancies can at least partially be explained by measurement errors, but the overall story is essentially that Hood River County didn’t fair too poorly during this 11 year period, despite the Great Recession. This suggests two things: be careful which statistics you use to tell your community’s story of success or failure and there just may be some things we could learn from Hood River County about moving the needle on these tough areas. 2. According to statistics from the Oregon Employment Department and Oregon Department of Education, however, Hood River County experienced increased unemployment and poverty across the 2000 to 2011 period. 3. There is a lot of measurement error in all of these estimates. Data from the long-form of the census and from the American Community Survey all come from a sample of the population. Each statistic has a margin of error between +/- 1% to +/- 4% for Hood River County. When you bear these margins of error in mind, the only statistic for which we can be 95% sure actually differed between the two time periods in Hood River County was the child poverty rate — that decline of 9 percentage points surpassed the margins of error in both years. Unemployment data from the Oregon Employment Department are estimates as well. See this article for an explanation of the methods they use to calculate Oregon’s unemployment rate: http://www.qualityinfo.org/olmisj/ArticleReader?itemid=00002668. 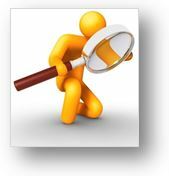 They estimate that the state’s unemployment rate in June 2013 had a margin of error of +/- .8%. County level rates will have slightly larger margins of error. Applying even this .8% margin of error to the Hood River County estimates of unemployment nullifies the increases reported by the Employment Department for the time period discussed above. Data from the Oregon Department of Education about eligibility of the student body for the free or reduced lunch program are also estimates, but the error in this statistic isn’t a function of pure, random sampling it’s a function of self-selection of the sample. In order to qualify for free or reduced lunch, the parents of children enrolled in school have to voluntarily complete an application for the program on which they report household income and the number of household members. If there is any reason for parents to feel uncomfortable about this reporting, perhaps they’re embarrassed about their income, they’re earning income under the table, or they’re undocumented immigrants, they may forgo completing the application. If, however, they feel safe reporting this information then they are more likely to do so. This means that increases in the percentage of kids who qualify for free or reduced lunch could be due to actual increases in the number of kids in low-income households or increases in the number of parents who feel comfortable reporting their low-income status. Given all the measurement error, it’s probably safest to say that the overall economic wellbeing of Hood River County residents didn’t change much between 2000 and 2007-11, but that it did improve for some kids whose families were able to move out of poverty and into moderate poverty. 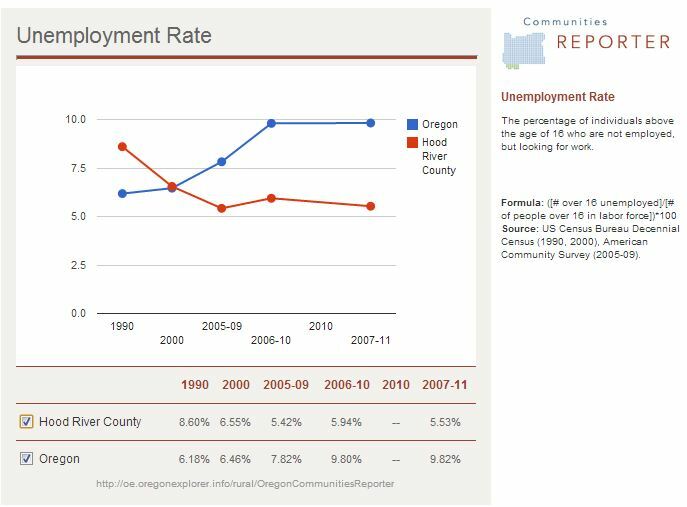 Now here’s the story, because in Oregon overall we definitely have seen statistically significant declines in the economic wellbeing of people between 2000 and 2007-11, and other Oregon counties experienced significant declines. So despite the less-than-perfect data, there does seem to be something positive going on in Hood River County worth further investigation and possible replication! Does anyone have any ideas about why the county fared so well in this period? We should investigate what’s going right in Hood River County. Is it their industry composition; the relationship between local institutions like the school system and vulnerable populations like Latinos and low-income families; is it something about their community culture; or something else? If we identify some factors, we need to understand why they contribute to the well-being of Hood River County. Then we can consider if it might be possible to replicate in our communities. If we do try to replicate we have to monitor that it does work in our community, and modify or scrap it if it doesn’t. Many of us orient ourselves toward developing programs that will “move the needle” on some significant economic and social outcomes that are measured using population estimates. So what does it take to really move the needle on these outcomes? The discussion today suggests that, statistically, it means we should aim to make an impact that results in a 5% to 10% improvement in the thing we’re trying to affect. If we don’t aim that big, we might not see any change at all because smaller changes won’t be statistically significant. Aiming big for most of us will probably mean aiming for multiple, long-term, incremental improvements. It’s doubtful that Hood River County found a silver bullet that took six months to implement. Have a long-range plan for improving population level outcomes that are measured with estimates, and make sure you track your short-term wins by evaluating your program’s impact on the people it has directly served. Don’t forget that it will take a long time for the needle to move in the population. This also means, don’t pull the plug on something that’s aimed at affecting population level outcomes, that’s only been around for a few years and you haven’t seen the population change (yet). If you’re seeing the desired changes in the participants, these changes in them persist over time, and these observable changes are DIRECTLY related to the population level change you want to see, then keep faith in the program for the long-haul. What else do you take away from this discussion of Hood River? The answer to the last blog post puzzler! Posted in Population Change, Rural. Small Towns around Here are Dying, Right? There’s a common belief out there that small towns are in decline. I was contacted by someone from the media a couple months ago who was looking for data that would prove just this point. What I shared surprised her quite a bit! Maybe it will surprise you too. 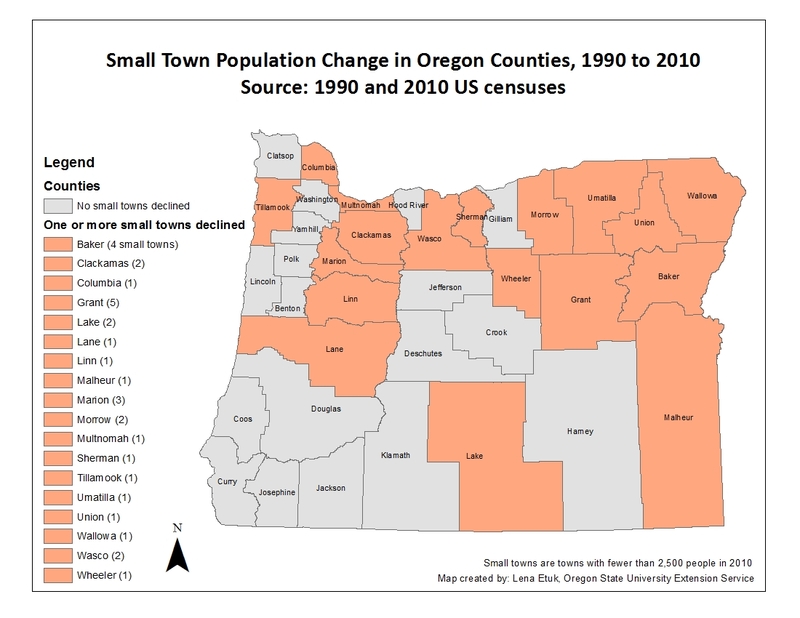 The vast majority of small towns in Oregon have increased in population over the last couple decades. Small towns that have declined are not spread evenly across the state, but small towns that increased population are present across the whole state. The demographic reason small towns haven’t declined is because as Oregon’s population increases we also see more and more people living in towns, large and small, as opposed to the outlying country-side. There are differences in the settlement patterns across counties; in some counties the vast majority of folks live in towns and in others, the majority of the population lives out in the county. In 2010, out of the 245 small towns (places with fewer than 2,500 people) in Oregon, only 31 (13%) had declined in population since 1990. The small towns that declined in population since 1990 were located in 18 counties (only half of all counties) in Oregon, and all counties but one had small towns that grew. All counties in Oregon, except for Crook, have small towns that increased in population between 1990 and 2010. Crook is the exception because it only has one town that’s recognized by the Census Bureau and it’s larger than 2,500 people (Prineville is the town and its 2010 population was 9,200). 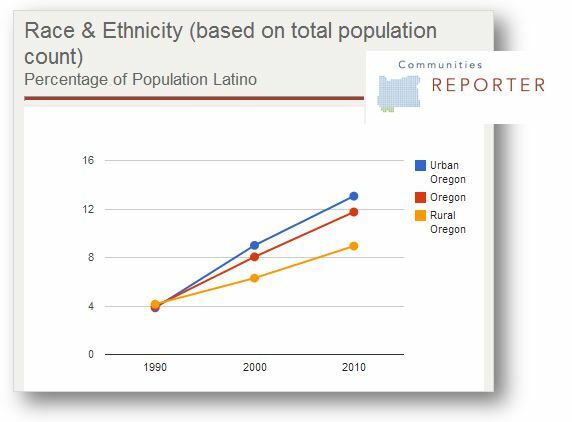 The population of Oregon increased by about 1 million people between 1990 and 2010. At the same time, the percentage of population living in towns went from 70% in 1990 to 79% in 2010. 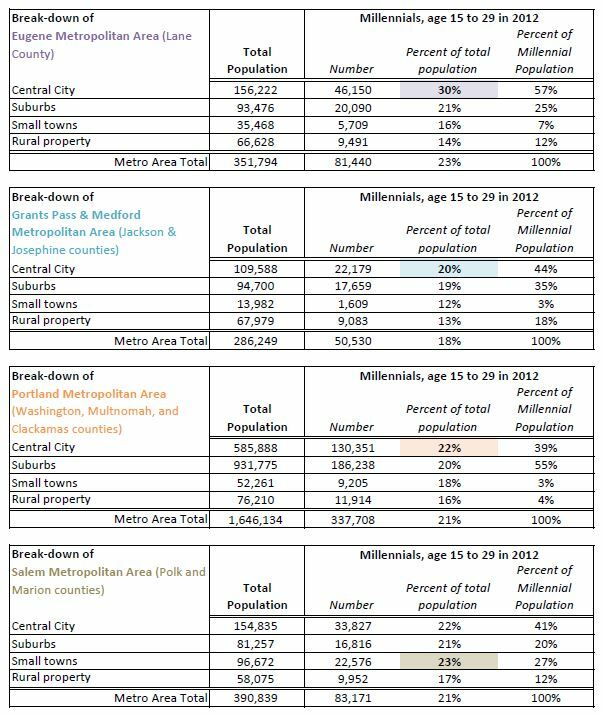 In other words, in 1990 30% of Oregonians lived in the “country-side” (villages and areas outside of town limits) and now in 2010 only about 20% of Oregonians do. The concept of a populated country-side is “dying,” not small-town life. About 52,000 fewer people lived outside of towns in 2010 than did in 1990, while the population living in small towns grew by about 42,000 people. Why do you think fewer Oregonians are living in the country-side? 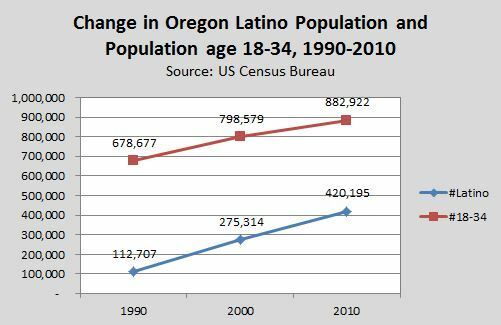 BUT, the population living in the rural country-side isn’t gone and it isn’t dying everywhere in Oregon! In Lake County, Crook County, and Polk County fewer than 50% of the population lived in towns in 2010. So this means that the majority of people in these counties live out in the county, outside of town limits. We should be planning our programs anticipating modest growth in small-towns. People don’t just move to our big cities in Oregon. We should recognize that our rural populations, though still rural, are increasingly living in closer proximity to one another and our programs should reflect the needs that come along with small town life as opposed to life in the country-side. There are counties where the bulk of the population doesn’t live in towns. In those cases we should plan to invest significant resources in reaching those across the county, outside of the town centers. Also, we need to bear the lifestyle (longer travel times to work and services, more place-bound activities) and the values (perhaps related to a desire not to be tied to city ordinances, taxes, and rules) of this population in mind when we design our programs. What else do these data suggest to you about how we should be thinking about Extension or other programs? It’s well-known that young people typically leave rural areas in search of higher education and work opportunities. 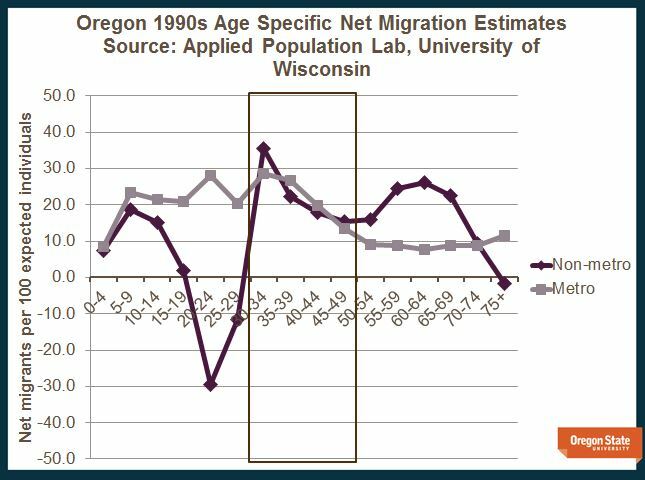 There’s also a common belief out there that this out-migration of young people represents a “brain drain.” Recently, a University of Minnesota Extension study showed that though young people (18-29) might be leaving rural areas, between 1990 and 2010 rural areas across the US were attracting people age 30-49. These authors argue that this is evidence of a rural “brain gain.” So the question for us is, is this true for Oregon? Is this really a brain gain? Net in-migration of 30-49 year olds is not associated with gains in the level of education among the population. Correlation of non-metro net migration rates with change in the percent of adults age 25+ with a Bachelor’s or more actually reveals a negative relationship in the 1990s and 2000s (rho = -.47 for 1990s, rho = -.08 for 2000s). 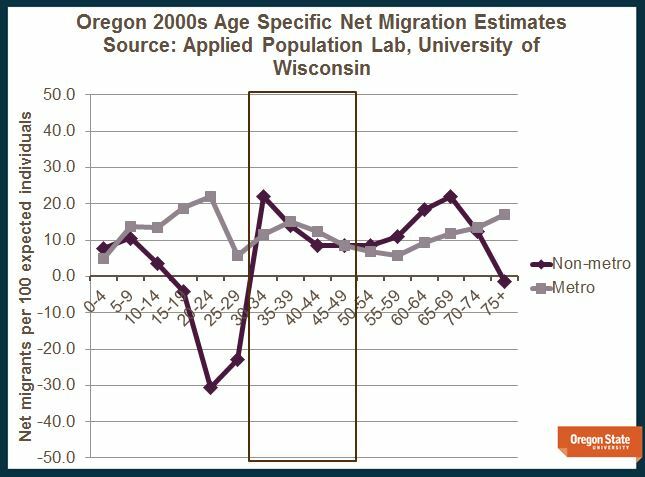 This means that counties with higher net in-migration rates of people age 30 to 49 had lower growth in the percent of people with a Bachelor’s or more in these two decades. In other words, counties with high rates of in-migration of 30-49 year olds saw low growth in educational attainment, while counties with low rates of in-migration of 30-49 year olds saw high growth in educational attainment. According to linear regression, these negative correlations were statistically significant for the 1990s, but very small (b = -.0057), and non-existent for the 2000s. This ultimately means that in the 2000s net in-migration of 30 to 49 years had nothing to do with changes in educational attainment among the population, and in the 1990s net in-migration had only a small amount to do with changes in educational attainment, and they were negative. The education levels of rural 30-49 year old in-migrants in the 1990s were actually relatively low. We aren’t accurately measuring brain gain. Instead of using overall educational attainment in counties perhaps we need to be measuring the “brainy-ness” of the in-migrants themselves. Unfortunately, we don’t know the education levels of these in-migrants because the data don’t exist. The effect of in-migrants age 30-49 on the overall education level in the non-metro counties may be muted by the presence of other age groups and their education levels. New-comers, age 30 to 49, are a reality in our rural communities. This means we can think about and talk about rural communities in Oregon as places of growth in this respect. Out-migration of youth can happen at the same time as in-migration of middle-aged adults. It also means that we shouldn’t forget to include these new-comers in our programs. They may have some cool ideas about new programs or ways of offering current programs and they’ll likely benefit greatly from being involved! The data also show us that we can’t infer that the in-migration of middle-aged adults to rural areas represents a brain gain. If we want to find out about the education levels of this new population, we need to gather better data. What else do you take away from these data?